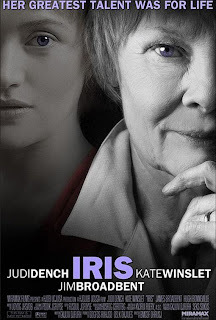 Iris is a 2001 film based on the life of Irish writer Iris Murdoch taken from the book Elegy for Iris, written by Iris Murdoch's husband, John Bayley. Murdoch died in 1999 after several years of suffering from Alzheimer's disease. The movie jumps back and forth between Murdoch's youth and the beginning of her relationship with Bayley and the later years of their marriage, as Murdoch's mind begins to slip away. Iris Murdoch was an intelligent and independent young woman when she met John Bayley, a somewhat proper Oxford professor. He has a difficult time coming to terms with her free spirited nature and shady history(at least for the time) with men. He comments about the all different worlds Iris lives in. Later in life, as her Alzheimer's is getting worse, he again speaks about the different world she is falling into. The film expresses the frustration and sadness of John as he watches his very intelligent wife slip into her own world. (Imagine a literary genius sitting in front of the television watching Teletubbies.) Things begin to fall apart as Iris at times becomes agitated and wanders off. John starts to fall apart as well. Below is a section from the movie. You can see how the issues of the past and present are interwoven. You can see how his frustration turns to rage and how events of the past seem to fuel this. The way the film is structured, flashing back and forth, it compares the incidents of the past with those of the present. It compares the young, vibrant Iris with the older, demented Iris. One scene shows Iris riding on a bike with John trying to catch up with her. Then it shows the elderly John driving around town trying to find Iris who has wandered off. You see a young Iris swimming naked, carefree, then jump to an older Iris, with her husband struggling with her in the water as she becomes agitated. I thought this movie was a good palliative care film because of how it deals with a chronic illness I see so often, Alzheimer's disease. It shows the extreme frustration that caregivers of people with dementia often feel. I also loved they way they meshed together the past and the present. I think it's intent is to bring out that even though Iris has changed so much, she is still the same person.